"A simple sugar syrup gives a golden sheen to this juicy berry cobbler that's a summer staple at our house. Also great with just peaches or a mix of both. Best with vanilla ice cream!" Preheat an oven to 450 degrees F (230 degrees C). Grease a 9x13-inch baking dish. Stir the berries, tapioca, and 1/2 cup of sugar together in a bowl until evenly blended. Spoon evenly into the prepared baking dish. Stir together the baking mix and milk in a separate bowl. 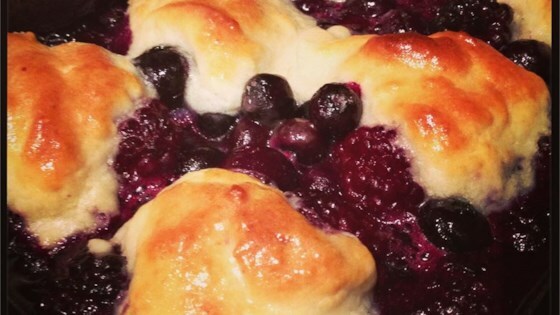 Drop dough over the cobbler by the spoonful. Bake the cobbler in the preheated oven for 15 minutes. Meanwhile, bring the water and 1/2 cup sugar to a boil in a small saucepan over high heat. Stir in the butter and vanilla extract, reduce heat to medium-low, and simmer 5 minutes; set aside. Once the cobbler has baked 15 minutes, remove from the oven, and drizzle evenly with the vanilla syrup. Return to the oven, and continue baking until the syrup has evaporated from the cobbler topping, about 5 minutes more. FABULOUS! Wonderful, creative, but original way to make your friends and family say WOW! Quickest and best cobbler I have ever made! Delicious! That's all that needs to be said! Super easy to make!! Even using frozen berries!! Great recipe I will try with a variety of berries!